We’re giving you a little sneak peak of the new Summer issue of our Real Food magazine. Our fabulous Director of Deli, Bakery, and Cheese, Patricia, has put together this delicious recipe…absolutely perfect for summer! Shuck the grilled corn and remove it from the cob. Remove any stems and slice the cherry tomatoes in half. Peel the avocado, remove the pit, and dice the flesh. Cut the cucumber into similar sized cubes. 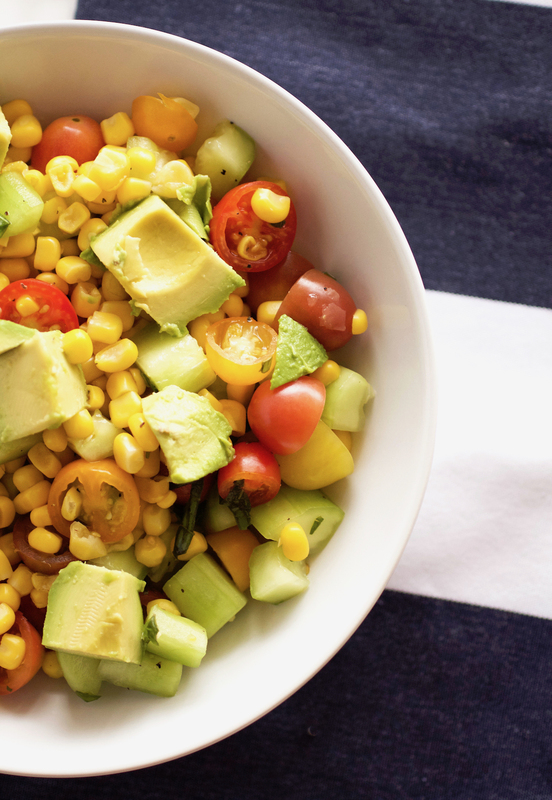 Place the corn kernels, tomatoes, avocado, cucumber and basil in a serving bowl and season with salt and freshly ground black pepper. Pour the vinaigrette dressing over the salad and gently mix together. Taste, and add more salt and pepper if desired. Cook’s Note: Fresh, sweet corn is excellent raw. However, if you do want to use cooked corn, I suggest grilling it. First shuck and lightly oil, then cook over a fire for 10 to 15 minutes, turning it infrequently to give it a bit of char for texture and added flavor. Don’t forget to pick up your complimentary issue of Mollie Stone’s Real Food at your local Mollie Stone’s Markets to get more mouthwatering summer recipes and ideas. Be sure to share your favorite salad recipes with us in the comments below! Share your salad photos with us by posting onto our Facebook page or using the hashtag #CookingWithMollies on Instagram or Twitter.